Currently, the largest sectors cashing in on additive manufacturing are automotive design, rapid prototypes manufacturing, and aerospace and defense parts printing. However, many may be surprised to find that just two years from now, the dental industry is projected to be a substantial player. In fact, one SmartTech report found that last year alone, dental 3D printing grew by over 35%. This same report predicted that the dental market would represent a $9.5 billion (USD) opportunity by 2027. If you’ve been interested in learning more about this amazing technological advancement and how it is impacting the dental industry both presently and in the future read on. 3D printing, known as additive manufacturing, is a layer-by-layer process by which a computer creates a three-dimensional, physical object from a digital design. The benefit of additive manufacturing (3D printing) is that it allows the production of shapes of much greater complexity while simultaneously utilizing less material than traditional manufacturing methods. 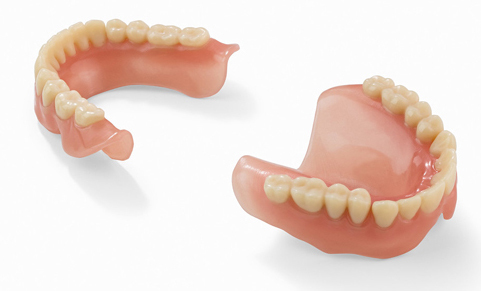 How is 3D printing used in dentistry? 3D printing is used extensively in labs, including both resin and SLM printing (Selective Laser Melting). 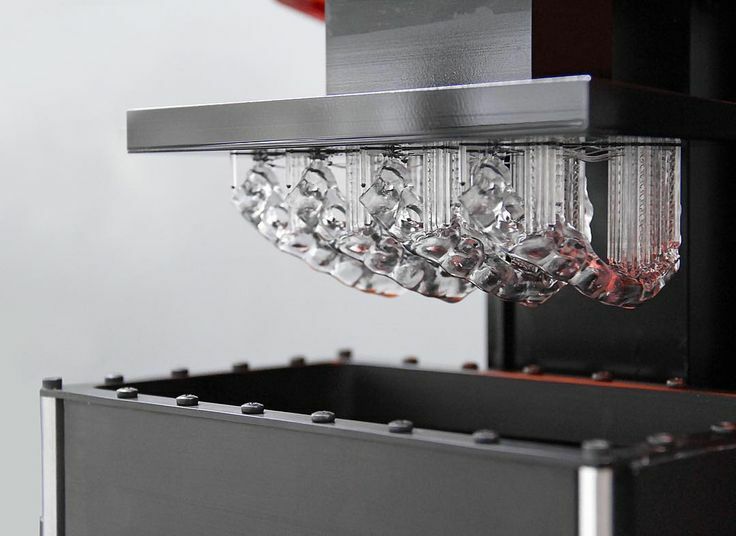 Selective Laser Melting is an additive manufacturing technique that can print metal parts in 3D, by means of a laser melting metallic powder in specific places. Additionally, a growing number of dental offices use resin printing in a number of different ways. 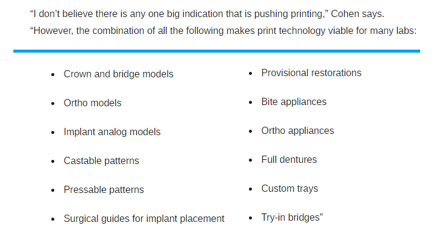 According to Nick Azzara, Chief Sales and Marketing Officer at BEGO, USA, resin printing offers “great options to many solutions inconvenient to mill” and gets the job done well regarding tooth fabrication in terms of both strength and aesthetics. 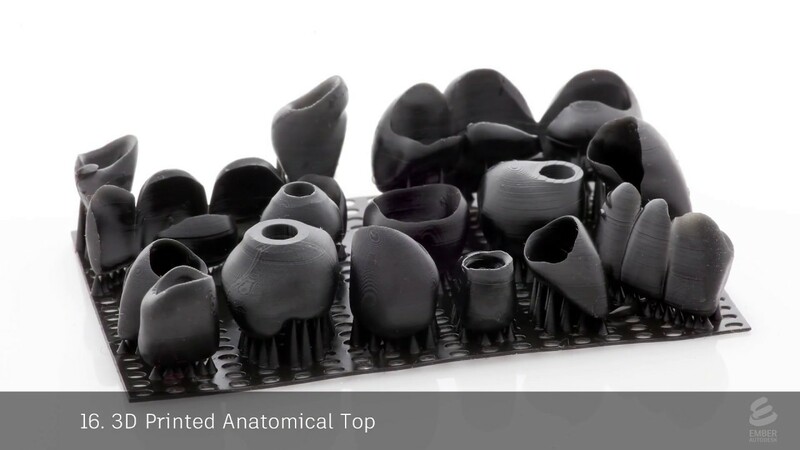 Crowns, surgical guides, orthodontic appliances – you name it , 3D printing can help create them in a more accurate, efficient, and cost-effective manner in many instances. “Everything is still model-based,” says Jeff Youngerman, a representative for 3D printing giant Stratasys. One notable manufacturer other than Stratasys is Form Labs, whose Form 2 SLA printer offers “intuitive, reliable stereolithography for the desktop.” The Form 2 starts at $3,350.00, and according to the manufacturer, “makes 3D printing affordable for dental businesses of all sizes.” Recently, at the Hinman dental meeting in Atlanta I noticed that Henry Schein was displaying a Form 2 in their booth. Apparently, there may be some sort of distribution agreement between these companies. The future of 3D printing in dentistry. “The key will be printing the final restoration with clean and easy post-processing. 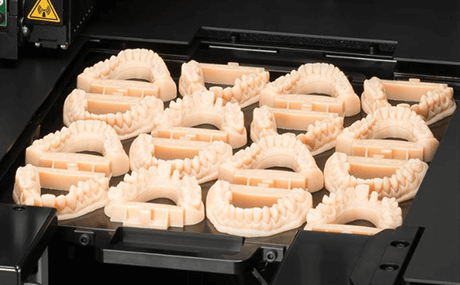 That’s the end game for 3D printing in the dental industry,” says Chris Frye, the Digital Technology Solutions Sales Manager and Dental Channel Sales Manager with Whip Mix. This game-changing opportunity could become a reality within as little as five years, pending the availability of improved substrates, according to one article by Modern Dental Network. In future I suspect that most of us will have 3D printers in our labs that enable manufacturing a wide variety of resin appliances in a very fast and accurate manner. In our group practice one of our doctors, generally an early adopter of a lot of technology, purchased a $1000 Prusa Mk 2 3D printer. He assembled it himself and spent quite a bit of time learning how to print with it. Unfortunately, at top speed, it took about 4 to 5 hours to crank out even the most simple model or surgical guide. That, and his reports of surface irregularities, have him wanting us to purchase a Form 2. Regardless, the end result is nothing but net decreased overhead, more efficient workspaces and improved patient experiences. There are limitless potential benefits for creatively harnessing the power of additive manufacturing in dentistry. 3D printing already can reduce time and increase accuracy and efficiency for fabrication of models, splints, surgical guides, etc. I am certainly looking forward to seeing how the future unfolds for dental offices and labs alike. Please feel free to share your comments on this article and your own experiences with 3D printing.